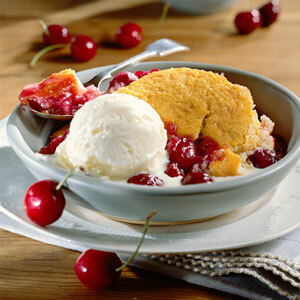 Today is National Cherry Cobbler Day! Here’s a tried and true cherry cobbler recipe from Southern Living (printed in 1999). Yes, this is a recipe that I have in my possession from my Southern Living days. It’s a good one. Enjoy. Bring cherries, 3/4 cup sugar, cornstarch, 1/2 cup water, and, if desired, food coloring to a boil ina medium saucepan, stirring constantly. Boil, stirring constantly, 1 minute. Remove from heat; stir in 3 tablespoons butter, lemon rind, and almond extract. Pour into a lightly greased 11- x 7-inch baking dish. Combine remaining 3/4 cup sugar, flour, baking powder, and salt in a large mixing bowl. Add milk, 1/4 cup butter, and vanilla, and beat at medium speed with an electric mixer 2 minutes. Add egg, and beat 2 more minutes. Spoon batter evenly over cherry mixture. Bake at 350° for 40 to 45 minutes or until golden, shielding with aluminum foil during the last 10 minutes to prevent excessive browning, if necessary. Cool in dish on a wire rack 15 to 20 minutes. Serve warm with ice cream. *3 (14.5 ounce) cans pitted tart red cherries can be substituted. Drain cherries, reserving 1/2 cup juice. Substitute reserved juice for 1/2 cup water. In the world of irony (where I tend to live most of my life) in Ireland, today is National Famine Memorial Day. Not sure if they celebrate by fasting or not, but I say let’s change tradition just in case and celebrate with COBBLER! This entry was posted in Uncategorized and tagged food, fun, misc., recipe by Just Call Me Mel. Bookmark the permalink.